The Pet Shop Boys don’t need slick moves on the dance floor to set it alight. The joke isn’t translating. Or crossing the oceans. Or, let’s be honest, just plain isn’t funny. 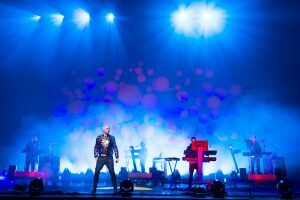 As the Pet Shop Boys release Electric – an album highly geared to the dance floor, possibly their most accessible piece of dance pop in years – I ask vocalist and lyricist Neil Tennant if he has some patented moves when he hits the floor. Right, then. Moving along to the appeal of dance music for someone who isn’t much of a dancer, Electric (produced by Tennant; his long-term musical partner, Chris Lowe; and electro-dance maven, DJ and occasional Madonna associate Stuart Price) carries a sense of euphoria, even set against the usual dry, if not deadpan, Tennant vocals. It taps directly into the thrill of clubbing any time in the past 40 years, which, it should be noted, is almost as long as the Pet Shop Boys have been hit makers. True, but as one of a pair that has written music for a film (the silent classic Battleship Potemkin) and a musical (Closer to Heaven), Tennant knows that to make the music in the first place, Tchaikovsky was immersed in the theatre and the music and context of ballet. Like the Pet Shop Boys, he didn’t need to be doing it to understand it; he was smart enough to get it. What has always been enjoyable about the Pet Shop Boys is a sense of intelligence that is part of the scene in which the band’s output sits – yet they remain separate from it and observe it, bringing in elements that rarely fly with the essential ephemeral nature of dance music, such as literature, art, film, philosophy and, latterly, middle-aged life. ”That’s what we’ve tried to do over the years, bringing together pure instances of physical pleasure with something more philosophical or political,” Tennant says. ”Because we don’t just like dance music, you know: this is probably only the second time we’ve made a dance record all the way through. ”All the way through our so-called career, we’ve always thought there should be no barriers in the songs you make; you can sing about any subject,” he says. ”Being in sync with what’s going on – well, our instinct is to swim against the tide. That standing outside the flow, of commenting truthfully, means that, bizarre as it might seem, there is something quite appropriate about the Pet Shop Boys covering Bruce Springsteen’s The Last to Die on this album. In sound, style and words, then, these two albums give you a sense of a group not so easily packaged as middle-aged men looking back or ageing hipsters trying to reclaim their youth.